Cerebral palsy is the term used to describe a group of disorders that result from certain problems with the development of or injury to a child’s brain. These disorders involve movement, hearing, sight, learning, and other cognitive functions, and may depend on which part of the brain has been injured. An injury to the cerebrum, for example, which is the largest part of the brain, can result in the loss of nerve function in several areas of the body. Some children may develop increased muscle tone, or spasticity, in one or both arms or legs, or on one side of the body. Others may exhibit difficulty with sucking, swallowing, and eating; irregular breathing; uncontrolled drooling; seizures; speech problems; or urinary incontinence. A child with cerebral palsy will usually exhibit symptoms before the age of two and as early as three months of age. Approximately 8,000 children are diagnosed with cerebral palsy, or CP, every year. The damages suffered by children and the families of children who have CP can amount to lifetime costs in the tens of millions. These may include past and future medical expenses, surgeries, physical and occupational therapy, psychological counseling, pain and suffering, and lost wages due to the inability to hold certain jobs. Though many cases of CP occur through no fault of the physicians and other medical personnel who have assisted in the births of these children, other cases of cerebral palsy may be caused by medical negligence or malpractice during childbirth. Cerebral palsy attorney Jeffrey Killino has considerable experience and expertise with all types of CP cases. If your child has been diagnosed with cerebral palsy and you suspect that your child’s CP was caused by medical malpractice, contact attorney Killino at 877-412-8490 for a free evaluation of your case. The negligence of medical personnel during a woman’s pregnancy or the labor and delivery stages of childbirth may result in a child’s cerebral palsy. Such negligence may occur through a failure to properly monitor the vital signs of the mother and fetus, to timely and adequately respond to fetal distress, or to diagnose and treat maternal infections, such as rubella, during pregnancy. Negligence, in the context of medical malpractice, is the breach of the standard of care owed by a physician or other medical professional to a patient. When an obstetrician has undertaken the care of a pregnant woman, the obstetrician has two patients, the woman and her as yet unborn child. Thus, the obstetrician owes a duty to exercise due care for the fetus’s as well as the mother’s safety during the mother’s pregnancy, the labor and delivery stages of childbirth, and for some time following the child’s birth. A great variety of medical errors may result in a child’s cerebral palsy injury. Though the American College of Obstetricians and Gynecologists (ACOG) has listed certain criteria for determining the causes of cerebral palsy, these listed causes are only some of the causes that may constitute negligence on the part of medical personnel resulting in a child’s CP. Cerebral palsy may be caused by any of a number of failures to exercise the required standard of care during labor or delivery. CP may be caused, for instance, when certain parts of a baby’s brain are damaged as the baby passes through the birth canal. This may occur when the fetus is deprived of oxygen by getting stuck in the birth canal, when the baby is not delivered within 24 hours of the mother’s water breaking, or when the umbilical cord becomes wrapped around the baby’s neck (known as nuchal cord). If an obstetrician or other medical personnel who are assisting in the birth of a child negligently fail to recognize and adequately manage these and other complications, the obstetrician and assisting medical professionals may be found liable in a medical malpractice action for a child’s CP that is determined to have been caused by the negligence of such medical personnel. 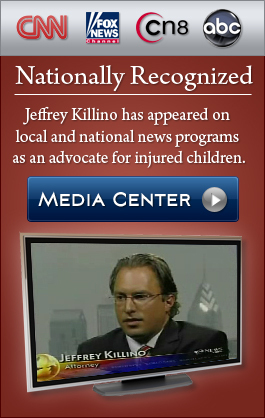 Birth injury lawyer and cerebral palsy lawyer Jeffrey Killino is dedicated to holding physicians and other medical personnel responsible for the suffering of children who have sustained CP or other birth injuries as a result of medical negligence. If your child has been diagnosed with CP or another birth injury and you suspect that your child’s injury was due to medical malpractice or negligence, contact attorney Jeffrey B. Killino at 877-412-8490 for aggressive assistance in seeking the justice you and your child deserve.